We all need some glow on our face right? It shows the happiness from within. But in this polluted atmosphere maintaining the glow though you are happy is quite difficult. We have to give our skin some external protection & maintenance to retain its glow. I have combination acne prone skin so most of the time I look for some herbal product for my skin care which does not harm my skin in long run. 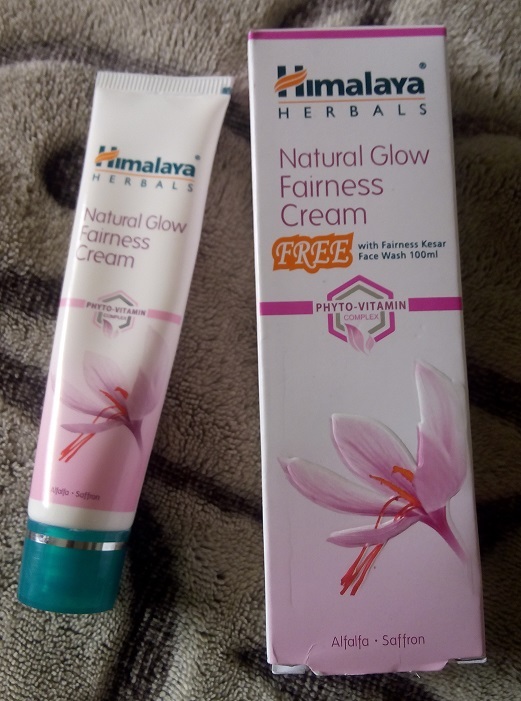 I got this Himalaya Herbals Natural Glow Fairness cream free with my favorite Himalaya Herbals Kesar face wash. So I gave it try to check whether it can help to reduce my red blemish given by my adult acne or not. So let’s move on the review. Fairness Cream: Nature's way to fairer skin. 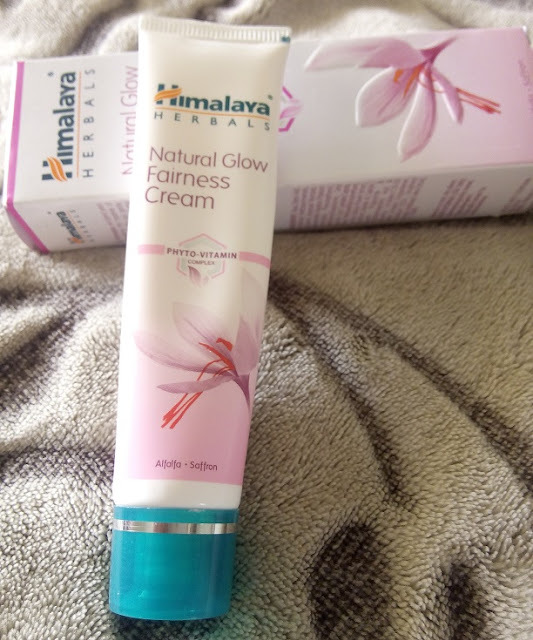 What it does: Himalaya’s Fairness Cream combines 100 percent natural ingredients to tackle a dull, uneven complexion and clear dark spots and discolored and pigmented skin. Its unique formulation ensures ease of application, faster absorption and better nourishment to the skin. Enriched with the extracts of Persian Rose, Mandarin Orange, Walnut and Aloe Vera, Fairness Cream works round the clock, providing four-dimensional fairness. The cream enhances the complexion, evens out skin tone, imparts a natural glow and reduces the appearance of blemishes. Its easy application and absorption helps nourish skin more effectively. The herbal combination also improves hydration and skin cell renewal at the epidermal cell layers. The result is visibly clearer and fairer skin, with the following benefits: Significant reduction in pigmentation, Increase in skin softness, Effectively lightens overall complexion, Skin glowing effect, Nourishes the skin, Key ingredients: Persian Rose revitalizes the skin by eliminating dead cells, impurities and excess oil and leaves it feeling rejuvenated. Walnut is a regenerative oil that is slightly acidic and kills bacteria on the skin. It is particularly effective in treating acne and in soothing sunburned skin and eczema. It removes dirt, blackheads and dead cells and nourishes the skin. Aloe Vera is used extensively in Ayurveda for wounds, burns, dermatitis and other skin ailments. It has antibacterial and astringent properties, which accelerate the healing of injured skin. Aloe Vera softens and moisturizes dry skin. Mandarin Orange improves blood and lymph circulation, particularly below the skin, which keeps the skin rejuvenated and looking young and vibrant. It is also useful in removing blemishes from the skin. The Himalaya herbals Fairness cream comes in the usual white & light pink card box packaging. The tube looks exactly same as the leading fair & lovely cream with the just green cap as difference. 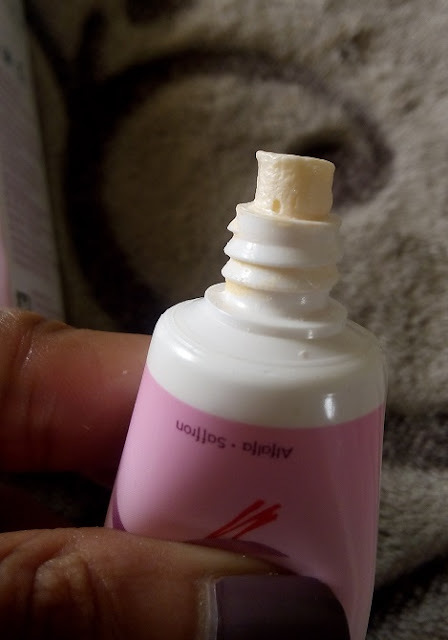 The smell of the cream is also just like Fair & Lovely cream. The color of the cream is peachy pink. The consistency is thick & it can spread easily on skin. For 1 minute it will feel a bit heavy on the skin but then it will settle down on its own & no heaviness then after. Basically I am not into fairness thing but most of the fairness product just gives brightening effect. This cream is free of the Bleach which is used by many fairness products manufacturers. One more plus point is that it is paraben free also. But the downside is this is not a totally herbal product. 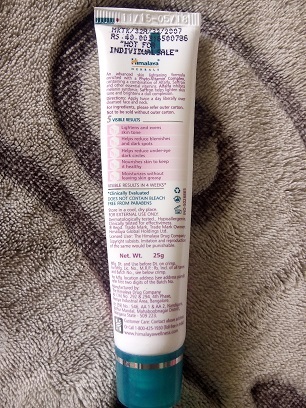 If you see the ingredient list you can notice many other chemicals used for making this fairness cream. I have used this cream on first day & it went all ok but after completion of two days application I have noticed a zit on my cheek. So I stopped using it. Then after a week I gave it another try but again as usual after 3 days it gave me another zit. 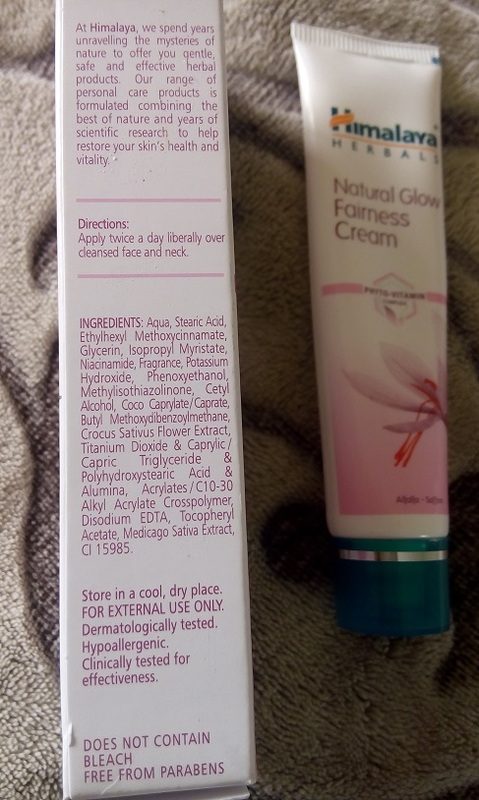 I understood that it is not behaving well on my acne prone skin, especially on my cheeks. The people who don’t have acne but only oily skin can use this cream as it lightens blemishes well. However I cannot afford another pimple for just lightning the scar of previous pimple. 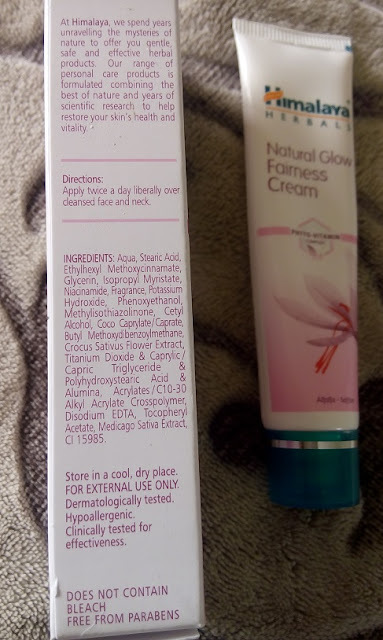 To cut the story short it didn’t suit my skin type otherwise I have very good experience with Himalaya herbals brand & I love most of their products which I have used till date. 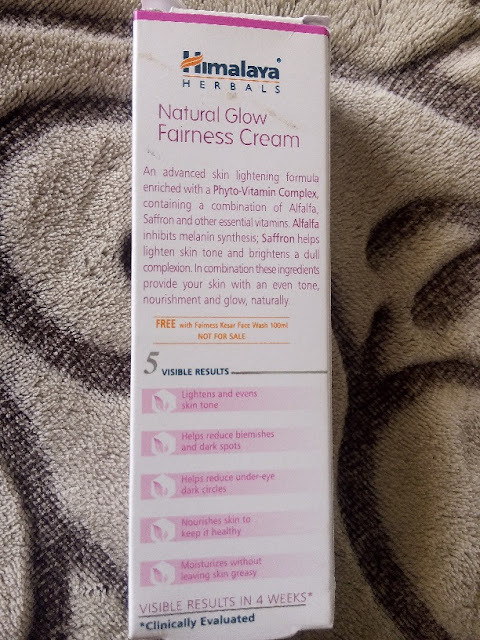 As I got this Himalaya Herbals Natural glow Fairness cream free with the Himalaya Kesar face wash, I am happy that my money have been saved. 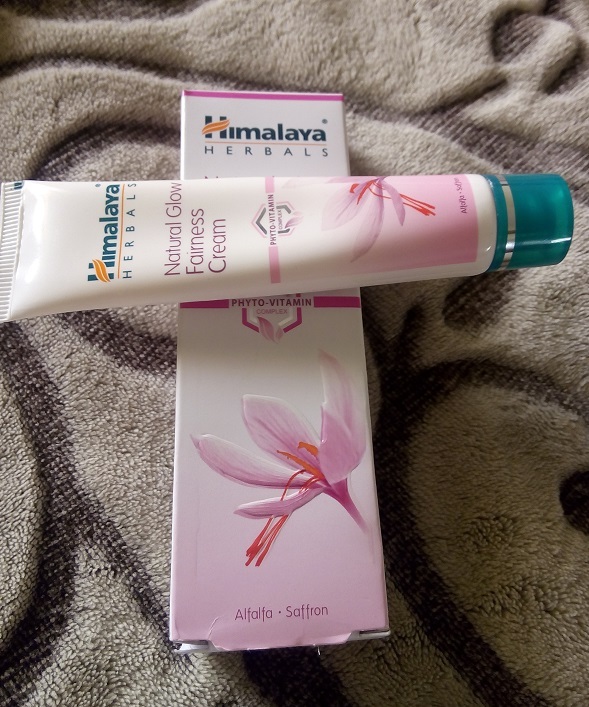 I will not try this cream in future but yes I love the Himalaya products from the neem range a lot. Have you used this Product already? If yes then please share your experience with the same in the comment section. Yikes.. I was put off by the name fairness itself.. Sounds very bad. Yes. I also don't like this fairness thing at all, every skin tone is perfect in itself. Instead of fairness they can use brightening term . well i regularly use himalaya products, can you tell me something about himalaya baby soaps are they good for babies? thank you. I like this it's really good! 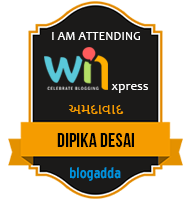 Best ever post for enhancing our beauty and i became regular reader of your blog. Keep useful posting like this. Also try these products. Why do we need sleep in the first place? Debra Messing Skin Cream Sleep is the ultimate rejuvenator. As we sleep, our body recharges and cell growth and regeneration speed up. That is why if you want youthful-looking skin, it would be best to rejuvenate the skin at night.